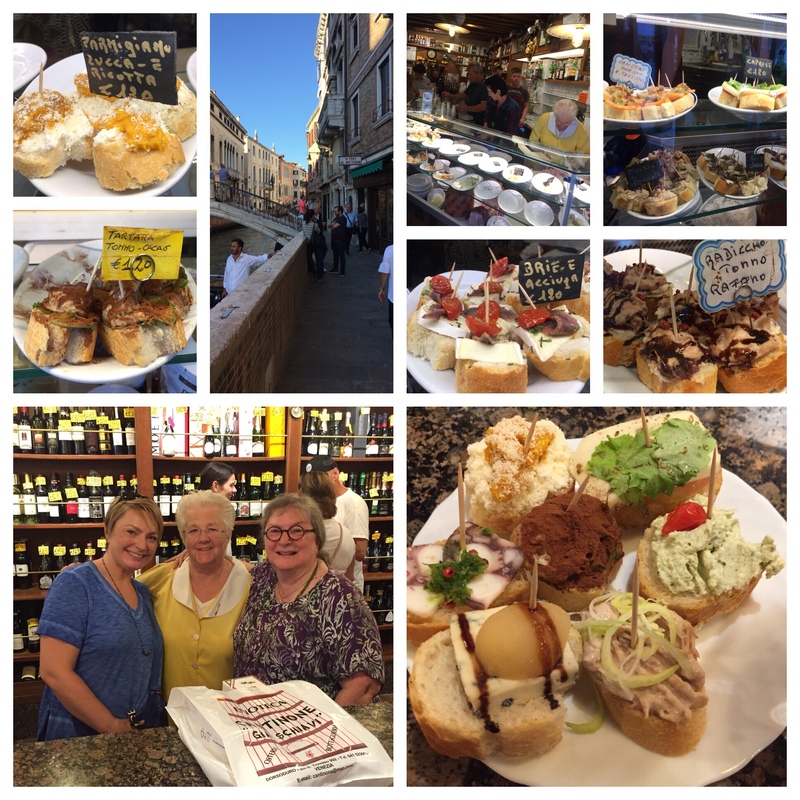 Clockwise from L: Parmesan, Pumpkin and Ricotta bites above the Tuna with Cacao bites; View of Cantine Schiavi from outside; Alessandra behind the counter; close-up of the counter and a few different plates; the incredible bites we selected; Mama and me with Alessandra! Mama and I were so exhausted from the last few days, we procrastinated leaving our Venetian apartment today, until it was nearly too late. We were drawn from rest by the memory of these incredible small bites packed with flavor. Friends we met on our trip five years ago introduced us to this gem. Cantine del Vino gia Schiavi is a legendary tavern, located in the Dorsoduro sestiere, near the gondola repair shop. We went several times during our previous trip. The food is fantastic and unique. Each little slice of bread is loaded down with the most interesting food pairings one could imagine. They’ve got great wine too, including our favorite, Moscato di Asti! And it is all reasonably priced. Mama and I recently saw Cantine Schiavi featured on Netflix’s “Somebody Feed Phil” — so this time we got a photo with the famous Alessandra! We took Phil’s suggestion and tried the tuna with cacao, and it was scrumptious! Our favorite was the pumpkin and ricotta with parmesan. They were all so good that we ordered a second round! Yum! Today’s #OneGoodThing was returning to a previous foodie favorite in Venice with Mama! Day 271 of 365. And Day 1,002 in a row (here’s the first 366 & the following 365)!